The first and most important thing to say about this new Mahler 7 is just how much fun it is to listen to. The work was composed in a very short space of time, making it slightly redundant to speculate about what was going round the composer's mind at the time. Even so, listening to a recording like this, where there is so much sheer joy in the playing, you get to thinking whether or not he was thinking of Beethoven's 7th when he wrote all those free-form country dances of the inside movements. And Neeme Järvi really makes the most of all of Mahler's orchestral effects, the mandolin, the cascading harps, the church bells at the end, and the SACD sound brings all of these added extras to the fore. The Symphony is a prime contender for the full SACD treatment, and Järvi makes sure that every orchestral detail makes its way onto the recording. I have to say, though, that I came to this disc with some trepidation. The previous offering from these forces was a Bruckner 5 that is an utter travesty, it's far too fast, has no nuance, no grandeur, if it wasn't for the superior audio it would have literally nothing going for it at all. This disc is better, but many of the traits of Järvi's Bruckner are also to be found here. Many of the tempi are on the fast side, and Mahler's tempo, rubato and dynamic indications are routinely ignored. 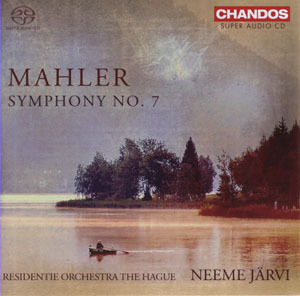 The 7th symphony really requires interpretation, and there are as many Mahler 7s as there are conductors who have tackled it. Generally speaking they fall into two categories, the ones who seek to repair the work's various structural problems and present it as a conventional symphony, and those who are prepared to give up on the overall structure and just enjoy the various disparate sections as they appear. For all his interest in orchestral colour, Järvi is clearly in the former category; he is determined to make the work add up at all costs. The faster tempi are part of his plan, as are the preparations for the many counter-intuitive time changes. You'll quite often find the music drastically slowing down over the course of eight bars or so, but without any such indication in the score. He also makes the most of all the surprises, for example the abrupt tutti outbursts in the midst of quiet woodwind ensembles in the Nachtmusik movements. These are often well ahead of the beat, refreshing the sense of surprise, even for those who know the score. What other surprises will you find here? Well, the horn solo at the start of the 2nd movement is loud and brash with the dotted semiquaver at the top of the phrase really clipped. This is exactly what is says in the score but I've never heard it played like that before – you can forget all about Castrol GTX. Good horn playing all round actually, the variety of timbres from the section is a real benefit in this superior audio. The rest of the brass struggle, especially the trumpets, who have a lot of notes, many of them very high, but not to the extent of excusing this number of splits. The string section is OK, one effect that Järvi goes easy on is the portamento that litters the string parts. Great playing from the leader, Lucian-Leonard Raiciof, who is pert, nimble and who appears seamlessly out of the tutti texture, then disappears seamlessly back into it. So what's missing from this recording? The ländler and waltzes of the inside movements don't have the rustic abandon you'd get from a Central European orchestra. A more serious problem is the lack of grandeur in the outer movements. Järvi never lingers at the climaxes, nor does he give the bottom end of the orchestra the space to play those imitative responses that characterise the codas. And while the tempos are fast, there are never any extremes in the speeds. I'd have liked to hear the Scherzo played faster, or at least a bit more lively. I think I understand Neeme Järvi's approach to Bruckner better for having heard this recording. Do I understand Mahler 7 any better for it? If anything, this recording is radical for the conductor's determination to present the 7th Symphony as a logically structured work. It isn't, but you've got to admire his conviction in trying to persuade us otherwise.